It is critical for every Encino Business to be Prepared to Recover FAST! Most businesses that don’t prepare, won’t survive the effects of a disaster. Some reopen, but soon close because they have been weakened or have lost customers. You have worked too hard on your business to let this happen to you.When our businesses are prepared and connected, we can help each other reopen quickly and promote our businesses so we can regain customers. Connected means being able to share information and support each other in their efforts to recover.We are using Encino.ReadyConnect.us as a toolkit to help businesses, employees, and residents prepare and be connected.This is an online toolkit with mobile app that will help you prepare your business and your employees. Here are some additional resources for you. Download the 10-question pdf checklist to prepare your business. 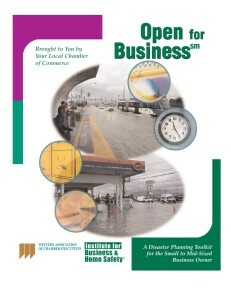 Click here for “Open for Business” – a disaster planning toolkit.